Recently I loaned a white dinner jacket to a friend who was going on a cruise. Not just any cruise, but a cruise that required a dinner jacket. In this case, it was a cruise on the Cunard Line’s Queen Mary 2, departing from Manhattan and arriving six days later at Southhampton in England. A week and a few days later, while my friends were still in England recovering from a magnificiant crossing, a postcard showed up in my letter box. I love getting postcards. 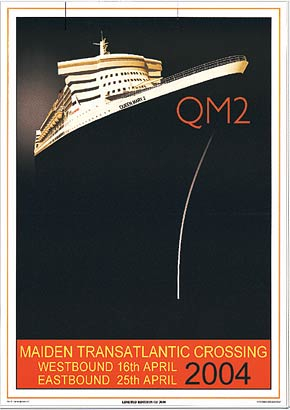 The card was a few very witty lines long, it showed the QM2 at sea. The cancelled postage stamp was English (45p.) It was the next best thing to being there. Over the years I’ve been lucky enough to collect quite a few postcards sent by my friends including a card with the memorable P.S. to “send money” (from my college housemates.) Then there was a wonderful cut-out shot of a London Cab that my dog got ahold of before I did. It held pride of place on my refrigerator door for almost a year. A card from Portugal was written in hilariously incorrect Portuguese and was a joy for the polyglot Ms. E to translate for me. At the moment, the QM2 card shares top billing with a card that my Mom sent to me from the Top of the Rock in NYC. I bet I give them the once-over a couple of times a day. Learn to write a postcard and get in the habit of sending it before your return. It doesn’t take too long or require multiple drafts. Your friends will always thank you for it. Hopefully with dinner to hear your amusing travel stories. In the meantime. Keep those cards and letters coming. Bon Voyage! This entry was posted in Elegantology and tagged Elegantology, travel. Bookmark the permalink.